Brahmi derives its name from the word Brahma or Brahman. Brahma is the divine God of Hinduism responsible for creativity, while Brahman is described by the Upanishads as truth-consciousness-bliss. Brahmi is said to promote Dhi (comprehension), Dhriti (retention of information) and Smriti (the ability to recall the information) – all the cognitive functions. The Charaka Samhita, the classical textbook of Ayurveda, categorizes brahmi among a group of herbs that improves immunity, supports the intellect (memory and mental acuity) and confers strength to the body. It is also known by other names, such as waterhyssop, thyme-leafed gratiola, water hyssop, herb of grace, and Indian pennywort. 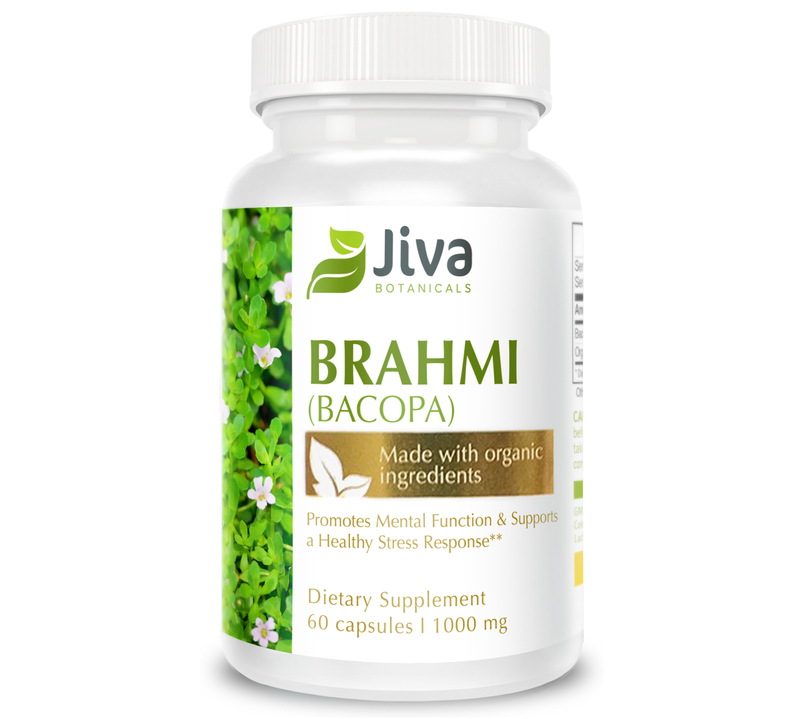 The botanical name of brahmi is bacopa monnieri, which has been shown to be much more beneficial than centella asiatica or Gotu Kola (an herb that offers almost similar benefits and is often confused for brahmi) as a potent herbal antioxidant. Both these herbs find use in skin conditions, as well as promoting fertility, but their therapeutic indications vary. In 1972 Romanian psychologist and chemist, Corneliu E. Giurge coined the term nootropic, and modern medicine began identifying substances that improve cognitive functions. 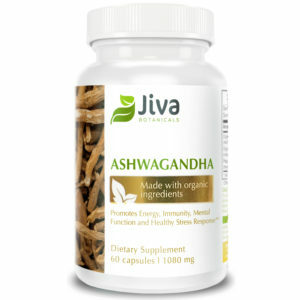 Thousands of years prior to this discovery, Ayurveda had already assigned this role to brahmi. 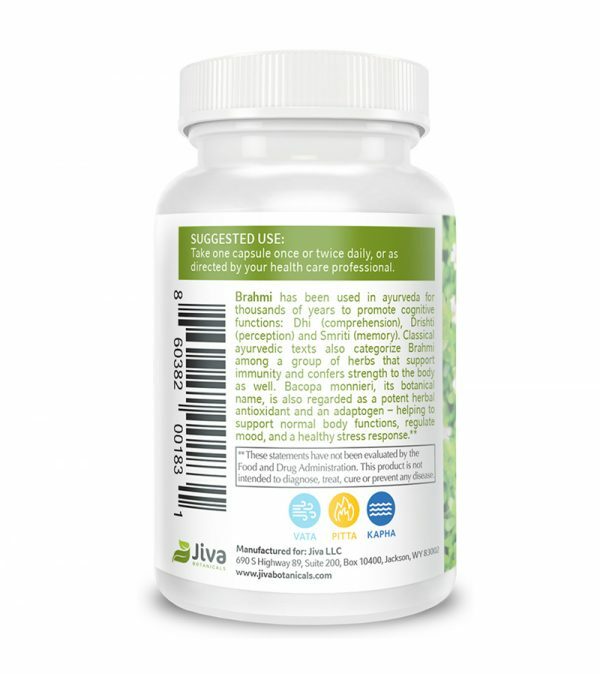 One of brahmi’s main functions is to support the brain processes that lead to memory formation and consolidation. It does this by improving/increasing the connections between brain cells; by increasing levels of neurotransmitters like serotonin – a brain chemical that helps to regulate mood, nervousness and stress, learning and retention of memory; and by acting as an adaptogen – helping to normalise body functions and to strengthen systems comprised by stress, improving mental and overall physical performance. The use of this herb could, in a few isolated cases, cause dry mouth, increased thirst, muscular fatigue, indigestion, and an increase in the frequency of bowel movements. In some cases it may cause palpitations and an increase in thyroid hormone levels. 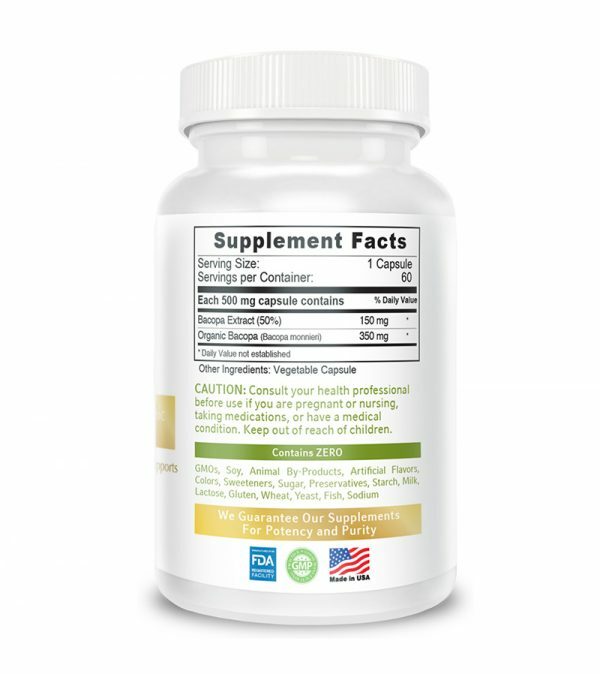 Caution is recommended when used with drugs or herbs that are metabolized by Cytochrome P450 enzymes. Similarly, patients using calcium blocking drugs and sedatives need to exercise caution as brahmi interacts with them. When used concomitantly with phenytoin, it may reverse phenytoin-induced cognitive impairment. We also discourage taking brahmi and alcohol together. Discontinue use immediately and consult your doctor if you feel any discomfort, pain, or physical or mental distress. 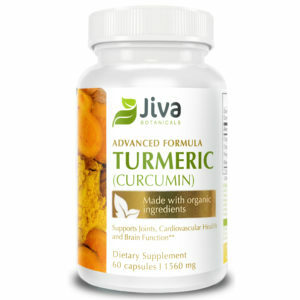 This herb is available in powder, capsule and tablet forms, and as a liquid extract. Advice on how to use it varies and may depend on the condition it is being used to treat. The traditional use depends on the age of the individual consuming it. In infants and children, it is mixed with ghee (clarified butter) to make brahmi ghrita. In adults, the powder can be taken with honey or warm milk. Brahmi pills and capsules are easy and therapeutically effective ways for administering this wonderful herb. 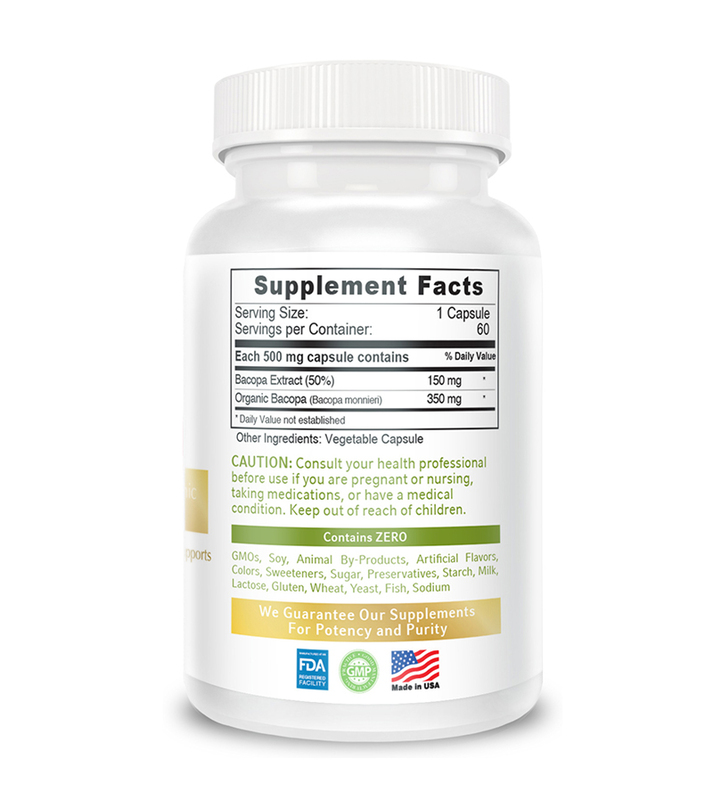 As a general daily health supplement, a dose in the range of 250-500 mg is most commonly recommended. A dosage of up to 1000 mg can be used for therapeutic purposes under the supervision of a qualified medical practitioner. Are there any side effects of taking a brahmi supplement? Side-effects are rare although large doses may cause nausea, fatigue, stomach upsets, which raises the question – is brahmi safe to use as supplement? Traditional use and a multitude of studies have shown that brahmi is safe to use in therapeutic amounts under the supervision of a doctor or qualified health care specialist. Further, numerous reviews state minimal to no side-effects. Yes, the botanical name is Bacopa monnieri. While the entire plant contains medicinal properties, it’s the leaves and the stalk that are primarily used in most herbal preparations and brahmi supplements. Which is the best brahmi supplement? 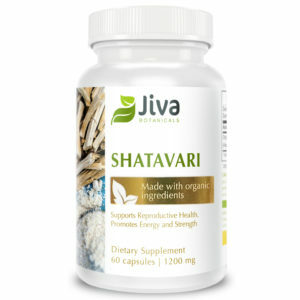 We are proud of the Ayurvedic supplements we offer at Jiva Botanicals. All of our ingredients are of the highest quality, ethically sourced, organically grown, and free of harmful chemicals and additives. 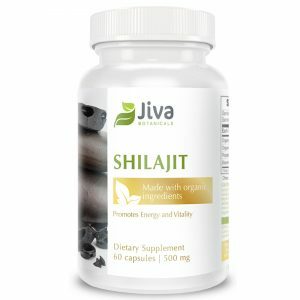 We believe that Jiva Botanicals is in the running for the best brahmi brand on the market today. The use of brahmi has been well chronicled from ancient to the modern times. It finds mention in the Atharva Veda (1200 BC) and acclaimed Ayurvedic texts like the Charka Samhita (4th Century BCE), and the Sushruta Samhita (6th Century BCE). There are many recent research studies that also document the effectiveness of this herb in conditions like stress, amnesia, strengthening of the immune system, potent antioxidant activity, dementia and a host of other conditions. An online search reveals a plethora of positive reviews. What is the best time of the day to take Brahmi? Brahmi is a medhya rasayana drug, and as such should be taken during the day, preferably in the morning. It is best taken just before breakfast and where a second dose is indicated, it is best taken before sunset. For best results and to avoid adverse stomach reactions, it should be taken prior to food or along with a glass of lukewarm milk. Chilled water or aerated drinks are best avoided along with brahmi supplements.